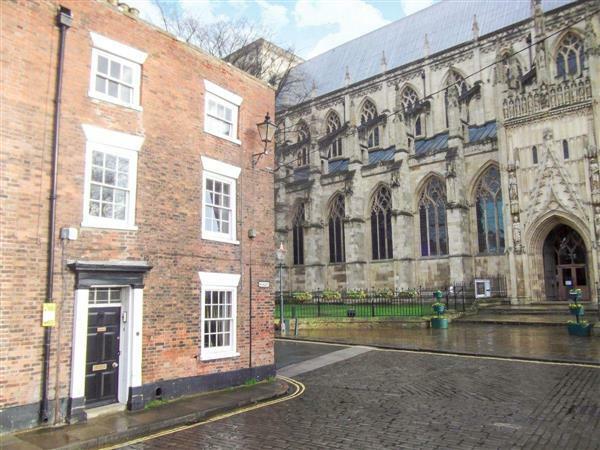 Beverley Minster House in Beverley, Yorkshire sleeps 6 people. Beverley Minster House in Beverley is in the shadow of historic Beverley Minster; this charmingly restored Grade II listed Georgian town house offers the perfect town centre holiday location from which to explore the attractions and amenities of this picturesque market town. The spacious property is spread over three storeys, accessed via period stairs, and has three bedrooms, two with en-suite facilities, a bathroom, a living room, a cloakroom, an open plan living/dining area with a fully fitted kitchen with patio doors leading onto an enclosed courtyard. All rooms have a view over the imposing minster, with its chiming clock and striking architecture. Free Wi-Fi and parking permits for nearby on-road parking are included. Whether you are looking to visit Beverley for the first time, attending the races or one of the town’s many festivals, or simply planning a get-together with family and friends, you can be sure of a warm welcome in the comfort of Beverley Minster House. Beverley is one of East Yorkshire’s hidden gems, and is regularly featured in the Sunday Times top ten list of the most desirable places to live in the UK. Its history can be traced as far back as the early 700s when John, Bishop of Hexham, founded a monastery on the site of Beverley Minster. The town developed over time and became famous for its brick, tile, leather, cloth and shipbuilding industries. Beverley Minster House is situated in one of the oldest parts of the town, directly opposite the minster, and provides the perfect location from which to discover its varied history, culture, shopping and dining opportunities. Within 100 yards of the property you can enjoy the hospitality of one of Beverley’s oldest pubs, and the nearest shop, restaurant and café are just 250 yards away. The town itself has no shortage of cafés, pubs and restaurants catering for all tastes and budgets. The centre is rapidly becoming a premier shopping destination, with a number of upmarket retailers, as well as a large bustling market that takes place each Saturday. As well as the minster, visitors can explore the charming St Mary’s Church in the Georgian Quarter, the museum and art gallery in the Treasure House or take in a performance at the atmospheric East Riding Theatre. Beverley boasts an impressive calendar of festivals throughout the year from folk and chamber music events to walking, food and one of the largest one day Victorian Christmas festivals in the country. The flat racing season at the Beverley racecourse also attracts many visitors to the town. Beverley is an excellent base from which to explore the local area, with a vast expanse of coastline, historic houses, attractive market towns and villages all accessible for a great day out. The nearest beach at Hornsea is only 13 miles away. The unspoilt undulating hills of the Yorkshire Wolds offer a range of walking and cycling opportunities to suit any ability, with gorgeous views thrown in. The train station is just 500 yards away and offers services to Hull, the UK City of Culture 2017, Sheffield and Doncaster, as well as the coast with the resorts of Bridlington, Filey and Scarborough. The bus station is also in the town centre and has direct routes to the coast, Hull and York. The beach is 13 miles from Beverley Minster House in Beverley. With the shop and restaurant 250 yards, and the pub is 100 yards from Beverley Minster House. Living area: With gas wood burner, Freeview TV, DVD player and CD player. Sitting room: With gas fire and Freeview TV. Bathroom: With dragon foot bath, shower cubicle, toilet and heated towel rail. Bedroom 3: With zip and link super king-size bed (can be twin beds on request) and en-suite toilet. Gas central heating, gas, electricity, bed linen, towels and Wi-Fi included. Travel cot and highchair available on request. Enclosed courtyard with sitting-out area and garden furniture. On road parking, permit for 2 cars included. No smoking. Holidays at Beverley Minster House run from Friday to Friday. For a better idea of where Beverley Minster House is, you can see Beverley Minster House on the map below. Beverley Minster House is in North Humberside; should you be on the lookout for a special offer, you can find all the special offers in North Humberside. It's always worth checking to see what is on offer at the moment. Do you want to holiday near Beverley Minster House (UKC2820), you can see other cottages within 25 miles of Beverley Minster House; have a look to find your perfect holiday location.